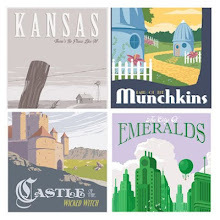 Steve Thomas [Illustration]: Star Wars travel posters are finally here! Star Wars travel posters are finally here! 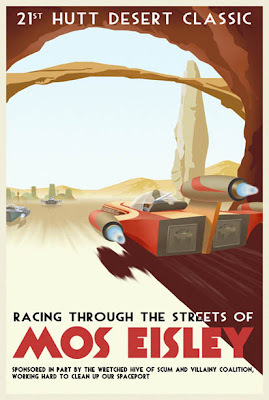 The first two Star Wars travel posters are up for sale Mos Eisley and The first two Star Wars travel posters are up for sale Kessel Run. I'm sending out an email also. I apologize if I missed anyone. I had such a huge response and tried to keep up with all the comments and anyone who left their email. As well as combing through blogger profiles. Some didn't list email addresses. Does anyone know if there is a way to reply to all the commenters at one time? 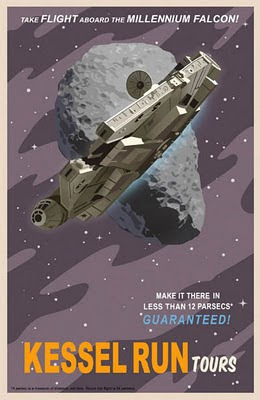 Just to clear up any confusion, there is an asterisk and a footnote on the Kessel Run poster explaining that a parsec is a measure of distance, not time. There is a close up of this on the Acme Archives website. Check it out! Steve, will regular prints also be offered in the future sometime? These are the only way they will be printed. Hope that helps. Any chance of the "Cruise the Galaxy" print making it up before Christmas? Thanks for sharing this information. I'm inspired to look through your other posts. Will come back to read more. Hope you can continue writing more great posts. I know many ways to send reply to all commenters at one time but I am not providing free service ? I was looking for this entry for a long time, but I wasn’t able to find a authentic source. Those are amazing posters, Star Wars is one of my favorite sagas ever. Hi Steve! I was a bit late in starting to pick up this excellent collection of posters. I have almost all but unfortunately can not get my hands on the Kessel Run poster. I know this is a limited run but any chance of making more copies of it? You would make this poor collector very very happy! I became searching for this particular access for a long period, but I wasn?¡¥t able to get the authentic origin.